Image designed by Bureau, courtesy of Musagetes. The following text is a modified version of the Sudbury Café Report which summarizes the findings and various positions in our dialogues. 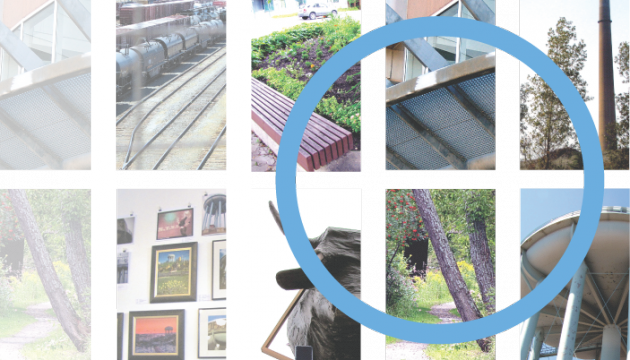 How do cultural acts produce meaning that is specific to Sudbury? Our earliest discussions centred on cultural importation with one significant example being the support of so-called “apex culture” through the building of large institutions like opera houses which are foreign to Sudbury’s experience. Why, then, does the majority of resources and capital get earmarked for new major cultural institutions? When discussions of resources arise, why is it so often about bricks and mortar? Any consideration of culture in Sudbury must include the strengths of the multiple communities that call this place home. Most agreed that culture resides in people and relationships, not in institutions: clearly there is room to shift the discourse. There are four interweaving narratives from the Café which continue to influence our work in Sudbury: Aboriginal Concepts, the Production of Franco-Ontarian Culture, “Should I Stay or Should I Go?”, and Landscape and Industry. In many aboriginal cultures, knowledge isn’t created, learned or gained; it is inherent in all of us. Knowledge is revealed and made known in the stories and narratives passed from generation to generation; knowledge is intuitive and shared person to person. This cultural importance of people and relationships was emphasized during the session titled The Production of Aboriginal Spaces. Within the overarching narrative of the passing of knowledge from generation to generation, we also learned of a micro-narrative under this larger umbrella: we learned that knowledge can be an experience. For example, knowledge is found in one’s experience of the built and natural environments, in architecture and the landscape. Trees have souls but the wood for building a house does not. Rocks have souls but the concrete for a sidewalk does not. Building on this concept of knowledge and approach to space, what does it mean to create a space that has a soul? During this session, it was equally noted that it is important to give people hope as a starting point, instilling a sense of pride in order to build something new. This was referred to as the “completion-backwards principle” which allows us to fulfill what we want, dream, and hope for. We envision it first, and then we make it happen. These are narratives we can build upon. How can Musagetes foster rich experiential spaces of hope? Sudbury’s Francophone culture exists outside the institutions that typify mainstream cultural production in Canadian cities. The theatres and galleries that are the pinnacle of what is often referred to as “apex culture” are present in Sudbury too, but they do not hold the same relevance for Francophone artists and their community. Rather, the artist- run culture (such as La Galérie du Nouvel-Ontario) or alternative spaces (such as La Librairie Grand Ciel Bleu) and the inter-disciplinary nature of cultural production are rich forms of inspiration and presentation which are a significant chapter in the story of Francophone artists in Greater Sudbury. In the mid-’70s, the Francophone community rallied around the new cultural lens of Franco-Ontarianism. This movement aimed to distinguish the production of Franco-Ontarian culture from the production of Québécois culture. They created an “imagined community” — a community that gave voice to the disempowered and marginalized Francophone culture. Marking this notion of the production of culture was the influence of “l’église, l’école et le bar” on the definition of culture. Now Francophone artists are seeking to liberate themselves from the need to identify themselves strictly as Franco-Ontarians. Looking to the period prior to 1975 for their inspiration, they prefer to pick and choose aspects of identity, bringing in Anglophone, francophone and Franco-Ontarian culture. Artists like Miriam Cusson draw inspiration from a breadth of experiences and cultures that are not necessarily Franco-Ontarian. Precariousness binds together the people of Sudbury; their lives are precarious because they choose to live in this place that is considered to be “no place to build a city”. Given the adverse conditions for stable employment and health, for example, what are the informal attractions to Sudbury? People move where it is affordable. What are the free aspects of Sudbury that are ready for the taking? Artists will not move North because institutions are there, but because informal relationships provide tempting possibilities that are unplanned yet compelling in the moment. What would attract artists to the North? We need to think on informal levels. The difficulties of transit make one’s world very small in Sudbury, especially for the younger generation. It often takes multiple connections between different buses for people in the smaller communities to reach the downtown on bus routes that are time-consuming and inefficient. During the session Be Not Afraid of Greatness, we asked ourselves: Does this generation feel a sense of belonging and opportunity? There exists a narrative of the Prodigal Son/Daughter who returns to live again in the North. He or she leaves and gains experience elsewhere and often comes back to share what has been learned. How could this story attract others? There is also an intergenerational breakdown or shift between those who stay and those who leave. Why do young people move on? One Café participant proposed that it is because Sudbury is built on sweat and hard labour, so there is a suspicion of intellectualism, which drives away those who are attracted to the pursuit of knowledge. Likewise, those who leave can be seen by some as having missed an important part of the ongoing conversation, making them less credible when they return. the sulphuric acid air pollution that, prior to the construction of the Superstack, could be said to be only a problem in Sudbury; now it’s everybody’s problem. This global significance of Sudbury necessitates healing strategies and new narratives that can allow for Sudburians to build a new sense of belonging and pride. Sudbury is suspicious of urbanity. Even though its geographical area could encompass all of Toronto, the greater city itself encompasses more rural land and small towns than any other city in North America. As a very function of this geography, Sudburians live and work in direct relationship to the landscape, an environment that forms the backdrop for life, leisure and industry. And yet this relationship represents a profound disjuncture between values that honour the landscape as a living organism and values that ravage the landscape for economic gain. The dominance of industry over the landscape is not a uniquely Sudburian story, or even a Canadian one, but it is one that shapes the culture of Sudbury. For some, the convergence of the political, the economic, and the topographical presents an intractable situation marked by damaged landscapes and urban blight. For others the possibilities for change are characterized by experimentation with cultural, social, spatial, pedagogic and economic possibilities. The flow of capital and the production of culture in Sudbury were (and, to some degree, still are) determined by industry in the form of sponsorships from mining corporations such as Inco and Falconbridge and support from the labour unions. Once strong and vibrant, the unions offered a cultural alternative that was often in protest against the institutional models supported by corporations — models that were designed to diminish community-building capacities that opposed the capitalist mainstream. At one time Mine Mill Hall became the battleground in a war between culture and capitalism; the union established powerful collaborations with artists in the 1950s to wage this battle. Such narratives from Sudbury’s past have immense relevance today. Exemplifying the contradictions inherent in Sudbury’s complex urban-rural narrative, the amalgamation of the city in 2001 further politicized existing issues of cultural inclusivity, accessibility, economic disparity and social responsibility. On the one hand, the dispersed community – the archipelago of villages that comprise Greater Sudbury – presents opportunities and threats to personal and political identity. On the other hand, there are no additional services provided, causing issues between communities, and the landscape is devalorized because it is an impediment to efficiency. In spite of all this, most would agree that Sudbury is greater because of its outlying communities. The topography puts intense pressure on simply finding a place to build. The paucity of buildable land in the downtown area led to the bifurcation of the city in the booming post-war era. Almost half of the relatively flat downtown area is still occupied by railroads, and removing them has been discussed for years on end. Sudbury needs to generate new models of development for dwelling, recreation, institutions, public spaces, work places, etc, yet the populace clings to generic ideals of the good life. In Sudbury, artists are not needed to decorate the city but instead, to guide the urban discourse in more innovative and ecologically sustainable directions. Are there ways to build in greater harmony with the denatured landscape? A number of circumstances make the issue of spatial production by and for First Nations particularly relevant in Sudbury. As the largest urban centre in Northern Ontario, Sudbury is an important site in the dialectic of the City and the Reserve; it is both a source of social services and opportunities and a gateway to further urbanization. This is reflected in some recent initiatives, like the incorporation of a healing lodge into the new Sudbury Regional hospital and the establishment of a business incubator oriented to Aboriginal youth. Laurentian University’s mandate officially recognizes First Nations culture, and engagement with the issues surrounding design in First Nations communities is part of the task claimed by the proposed School of Architecture. The Ontario College of Art and Design University is proposing a transition year program for Aboriginal students from northern communities who intend to study at OCADU in Toronto, with this program likely housed at the School of Architecture. Sudbury has the potential to become a major site in Aboriginal initiatives towards the production of space. Francophone cultural institutions are, by any account, the most active, coherent and dynamic in the City of Greater Sudbury/La Ville du Grand Sudbury. These diverse institutions include CBON-FM (the French- language arm of CBC), Collège Boréal, le Théâtre du Nouvel-Ontario, la Galerie du Nouvel-Ontario, Librarie Grand Ciel Blue, la Bouquinerie du Moulin, the Salon du Livre and Éditions Prise de Parole, among others. An overwhelmingly literary tendency can be recognized among these institutions, some of which were established in the seventies and eighties as part of the Nouvel-Ontario movement that paralleled the Separatist movement in Quebec. The right to language was the primary assertion of Franco-Ontarians at that time, and it was given urgency by the awareness that many youth caught in a process of assimilation risked being functionally illiterate in both their mother tongue and their acquired language. The literary character of French language arts in Sudbury can also be credited to the influence of multiple actors such as Fernand Dorais, Robert Dickson, Gaston Tremblay and denise truax, and more recently, Stephane Gautier, just to name a few. In any case, Sudbury has become something of a centre of excellence for Les Arts d’expression. The 1917 Report of the Royal Ontario Nickel Commission titled Nickel Deposits of the World is largely concerned with Sudbury, but includes reports on such distant and dispersed places as New Caledonia, Borneo, Cuba, China, Egypt, Madagascar, The Philippines, Russia, South Africa, and Tasmania. A few European nations and American places also appear in its contents, but without the priority they are customarily given in other geopolitical discourses. The practice of large-scale mining links Sudbury to other major sites of mineral extraction globally and it does so not in an abstract or categorical, but in a material way. This geo-cosmopolitan system is comprised of real flows of personnel, technology and expertise. It is not unusual for workers from Sudbury to have been to diverse places from Peru to Kazakhstan linked only by mining, and students come here to learn mining techniques from many mineral producing countries worldwide. The wealth that lies underground constitutes a global spatial order, one that is less commonly discussed than the system of ‘global cities,’ but which is no less important. It entails a particular relation to capital, the market, commodities and the landscape and creates similar conditions of uneven development and labour/territorial conflict. Despite its importance to Canada as a whole, this condition has not yet been adequately theorized in relation to development, and it has been given greater urgency by the unprecedented demand for non-precious metals over the last decade. The price surge in basic industrial metals and minerals has spurred more exploration than ever and even the revaluation of existing reserves, including byproducts of the past, like tailings. In fact, seventy percent of all world-wide mining exploration at present is conducted by Canadian corporations, and the Toronto Stock Exchange is significant in the global economic system largely because it represents more mining corporations than any other exchange. Sudbury is a major node in this circuit, and it is slowly but surely consolidating a position as a centre for mining services and supplies used in hard rock mining throughout the world. We learned about the complex understandings of the production of culture in Sudbury during the Café. These understandings reflect a set of narratives about Greater Sudbury itself. What new narratives will take shape as Sudbury determines its future? As one Café participant said, we have to swerve away from linear, manufactured time and narratives—we have to swerve away from the mainstream—and towards cultural acts that contest, question and inspire. Musagetes is working in Sudbury to better understand how the arts can inspire new narratives. As we are idedicated to fostering temporary spaces for permanent change, the organization can learn from and share informal approaches tethered to long-term mindshifts. Since these September 2011 discussions in Sudbury, we continue to consider these questions: Who is going to create the new narratives for Sudbury? How do we support the leadership for these narratives? Who will enrich them? Who will keep this work on the agenda?